UPDATE: The University of Montevallo will operate on a normal schedule Thursday, Jan. 18. We realize many students, faculty and staff may be driving to and from campus and we urge everyone to use their best judgment if they must travel. Please monitor a reliable source of weather information for updates on road conditions. The University will provide updates via UM Alert and social media should further communication be necessary. 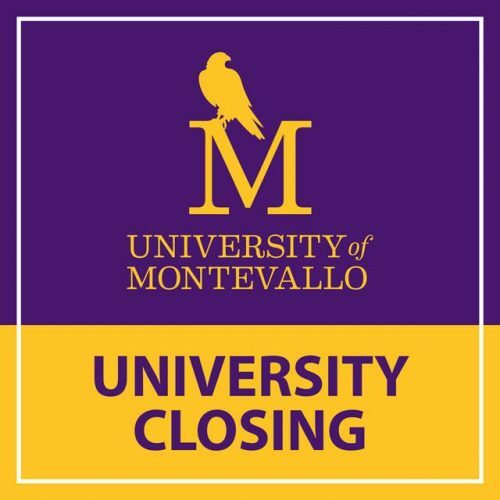 UPDATE: Due to continuing hazardous road conditions in areas surrounding campus as well as the extreme cold temperatures, the University of Montevallo will be closed the remainder of the day Wednesday, Jan. 17. This includes all classes and extracurricular activities. Anna Irvin Dining Hall will continue to operate on a normal schedule. Please monitor a reliable source of weather information. The University will provide official updates via UM Alert and social media should further communication be necessary. UPDATE: Due to the threat of dangerous road conditions in and around the City of Montevallo, and for the safety of our campus community, the University of Montevallo will delay opening until noon on Wednesday, Jan. 17. UM officials will continue to monitor road and campus conditions should hazardous conditions persist. Please monitor a reliable source of weather information. The University will provide official updates should further communication be necessary. The most recent weather forecast indicates winter weather could enter Central Alabama as early as 11 a.m. For the safety of our campus community, the University of Montevallo will be closed Tuesday, Jan. 16. This includes all classes and extracurricular activities. Anna Irvin Dining Hall will continue to operate on a normal schedule. Please monitor a reliable source of weather information. As always, the University will provide updates via UMAlert and social media should further communication be necessary.